WHAT IS A POGIE OR BICYCLE MITTS OR DO YOU CALL THEM BIKE MITTENS?? Call them any of the above or any of the other names people have given them, they are the same thing with the same function. Pogies are very large glove type items that attach to handbars of no bodied vehicles, that is vehicles that do not have a body to them. Such as a Bicycle. They are made large and for Winter so that you can push your hands into them and keep your hands warm as you go. Pogies are nothing new. People have used them on Snowmobiles for many years. 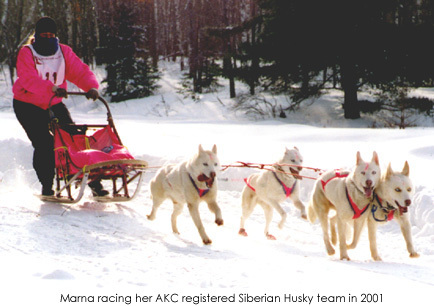 The Snowmobile People got the idea from the Sled Dog People who for many, many years, before there were Snowmobiles, had large Fur Mittens attached to the HandleBow of their Sleds. Now will see them on other types handlebars such as Bicycles everywhere. 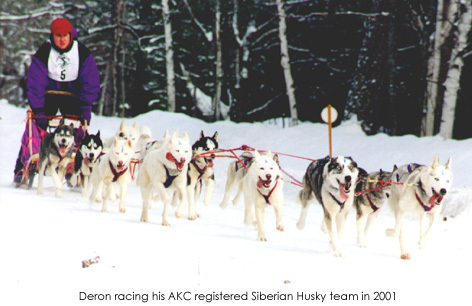 My Husband Deron and I met when we were running, training, and racing Sled Dogs. You can see some of our photos and read about our dogs on www.DogStarKennel.com as well as www.WorkingBigDogs.com look for our Dog Websites at the right hand side of the screen under Navigation. WHY DO SOME LOOK DIFFERENT? Different people, including us, have made their own designs and think they have the best. Each person made their own Patterns depending on how they thought they would look and work best. Some made their Patterns based on not using a lot of Fabrics, that is they want to get as many Pogies out of a yard of fabric as they possibly can, others, like us wanted Ample Hand Room within. Some of mine are made with Bright/Neon Fabrics, some match bicycle colors, and others are made for Bugging Out Of Town if things/times go/get ugly. No. Not All Pogies Are The Same. They come in different sizes and shapes. Every Pogie Maker that has made their own Pattern makes their Pogies the way they feel is best. And some are shaped differently for the different types of handlebars that are on the front of different bicycles. Look at the fabrics and materials they are made from. Some are made for different degrees in temperatures, some have little pockets inside, some are pretty, some are....well?, to me, I am not even sure the designers ever even tried them out before selling them. I had to laugh at some of the designs I had seen on the Internet. Some Pogies are designed to close at the wrist. They tighten down and hook. Tell Me? Did the person that designed those every USE them? All of the items that I make and sell are offered because people saw ours, the items we use/have used for ourselves or our animals.....and they wanted the items to use for themselves, their bicycle rides, or their animals too. There is a reason I do not have all the different types of Pogies for all types of handlebars made up yet. I don't sell items I do not design patterns for and use ourselves first. I do hope to ride other types of bicycles so that I can get an idea of how the Pogies could be best made up and used. Deron and I ride our bicycles in all weather, yes. If we are out there and it starts to rain, many times we finish our ride before heading back to the vehicle. I have a Fatty Snow Bicycle and I bought it to actually ride in the Snow. So I started making my cold weather gear. 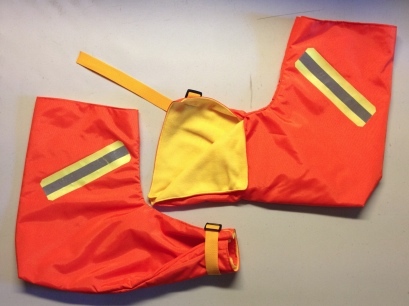 The type of Pogies I make are pair/sets are made from my own pattern that I designed for our own use on our own bicycles. 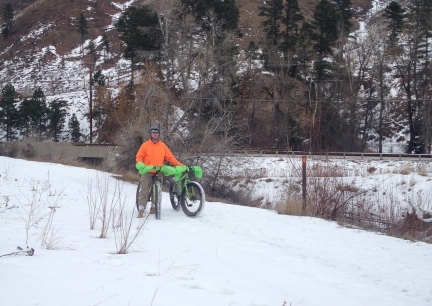 They work well on Mt Bike Type Handlebars and are especially nice on cold, windy and or snowy days. HOW DO THEY GO ONTO THE HANDLEBARS? The Pogies go onto your bicycle with the Reflective Strip side facing out away from the rider. (unless you are using them in a Bug Out Situation, or are Hunting and don't want to be seen, then turn them around so that the Reflective Stripes are facing the rider). The Tie Down Strap end goes around/wraps your handlebars, over your everything (you might want to leave your reflectors showing - I also leave my odometer out/showing). The strap can be left a bit loose to let air in for warmer days, or when your hands are getting too warm. I normally use my thinner fingered Bike Gloves when riding with Pogies even on very cold days and they have worked for me very well. The Pogies fit the Handlebars big so that you can get your hand in and out of them easily. Pogies are great for cold and especially windy days. Our Winter Wind here, in NW SD, is not even mentioned in the forecast on TV unless it is 55 MPH or more.... Winter = Wind here. Anyway, I love my Pogies! Deron tried my first pair out on a cold windy ride and wanted a pair too. 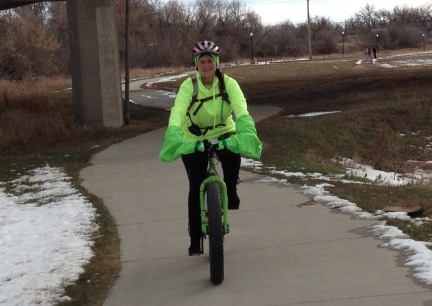 We have used them on Mickelson Trail as well as out here, NW SD, in town on Bike Paths and Trails, and on the open Prairie the Winter of 2014 with snow and high winds and the Pogies were so wonderful to have on our handlebars over our hands. I have and do make these in many colors and fabrics but have found that Cordura seems to work best for the stiffness to get your hands in and out easily as you ride, as well as being windproof and water resistant/proof. Cordura is Heavier than the Rip Stop although the Rip Stop does work well, at least on my own bicycle. 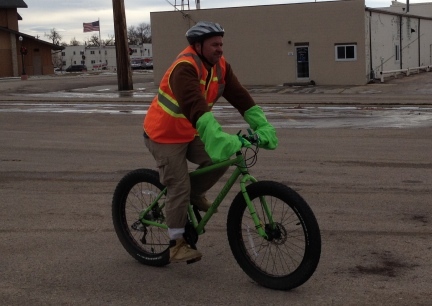 I like to use the bright colored Pogies so that vehicles can see us well as we ride near, on, or crossing Roads. I also like that I can see Deron and other riders in a flash when they are ahead of or behind me on the trail. And if needed, Emergency Help could find us quickly too. 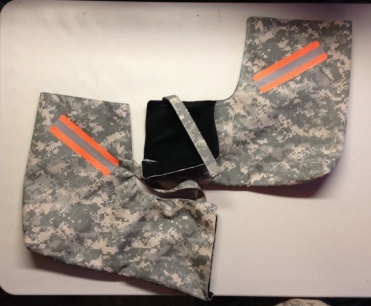 For many of the sets I make that are more of a dark or camo color I usually line inside in a color you can/could turn inside out and be used as a flag so that you would be found faster if needed. I have had people say to me they think that Bicycle Pogies are too expensive. Well. Then that person should try making their own QUALITY Bicycle Pogies and see what the costs are for materials and how much time is involved. Our Bicycle Pogies are made from our own patterns. We designed them for our own bikes. Our Bicycle Pogies and most others on the market have a variety of not so inexpensive materials to put them together. I buy the right fabrics, not cheap fabric. I line the inside of the Pogies with Quality Polar Fleece. 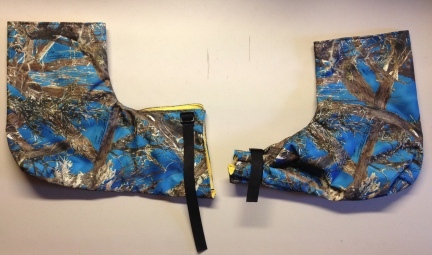 The outside of each Pogie is made from good quality fabrics, some more expensive then others. The Reflective Stripes are cut to a good length and ironed on well. I use a large, approx. 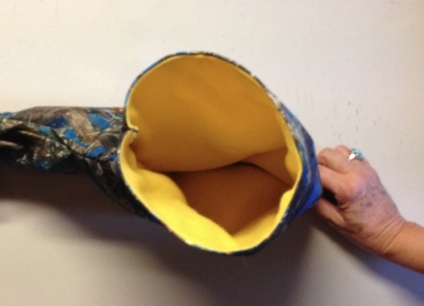 10" piece of webbing and a High Impact PLASTIC fastener (you don't want your cold hand to be stuck to or be handling metal in the cold of the Winter) so that they are sure to stay in place. Made In America, by an American. Ours are made in our non smoking home. WHEN WILL WE HAVE MORE UP FOR SALE ON THIS SITE? I try to keep several Pairs of Bicycle Pogies for sale on this site. However, there is no way I can have all the colors we offer for sale up at all times. 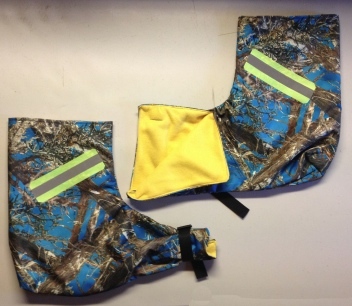 For Custom Pogies, that is, the colors and fabrics you want for your own Pogies Made Up, we charge the Price of the Pogies, Plus a $20 per pair, Custom Order Fee. Photos ~ Front, Back & Inside.